There are some pro-Second Amendment citizens that say they feel put off by the National Rifle Association’s politics. That’s leading to the emergence of left-leaning shooting groups across the country. Meet the Socialist Rifle Association in Alaska. 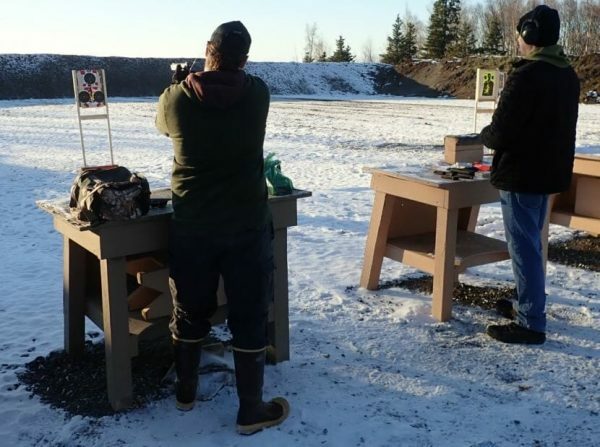 It’s the Sunday before the election and members of the Socialist Rifle Association are meeting at a public shooting range on the outskirts of Anchorage. It’s the group’s first “range day” where the membership (all two of them) meet to shoot guns and talk politics. This self-described socialist who works on the pipeline sports a ball cap, fuzzy facial hair and knee-high steel toe rubber boots. He believes strongly in the Second Amendment but said he’s put off by the apparent axis between mainstream gun culture and right-wing populism. “I was actually on the verge of joining the National Rifle Association but this one just seemed more in line with my views,” he said. The Socialist Rifle Association legally incorporated last month in Kansas. It’s part of trend of leftist gun groups that’s sprung up as an alternative to the NRA’s fiery rhetoric. “You look at some of the rhetoric that the NRA has been putting out over the last year or so, and I think possibly they’re the real extremists, not us,” said Nick, a 34-year-old warehouse worker from Anchorage. He’s helping set up the Socialist Rifle Association’s Alaska chapter. Why should self-described socialists organize a firearms association in the first place? 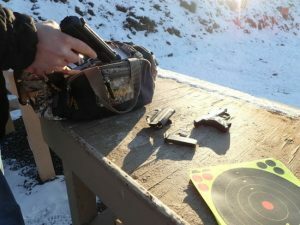 The right to bear arms is widely supported in Alaska. A poll in 2017 found 60 percent of Alaskans oppose stricter gun laws. The Second Amendment is one thing these guys and more right-wing gun enthusiasts do have in common. So why the anonymity? Both say they’re worried about their jobs. The pipeline worker said he often talks politics while on the job. But he’s worried that his managers could fire him for his unorthodox associations. There are no First Amendment protections in the workplace. “And I don’t want to scare anyone in my workplace with this. Because it is, it’s a really sensitive issue,” he added. It is sensitive. Organizing around guns and ideology in a polarized political climate has potential dangers. 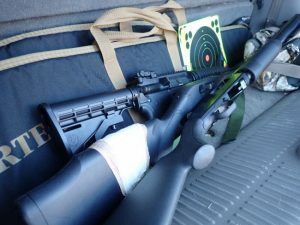 “Our society’s flooded with assault-style rifles,” said Bill Morlin, a veteran journalist who’s covered militia movements in the Pacific Northwest for decades. He now works for the Southern Poverty Law Center which tracks extremist groups and is a correspondent for its online publication Hatewatch. He recently covered a Patriot Prayer rally in Seattle this August where self-described alt-right militia and antifa counter-demonstrators faced off with rifles slung over shoulders and pistols in holsters. He said most political violence stems from the far-right. This year alone, his group has tracked at least 41 murders by far-right extremists or those who admitted to be inspired by far-right rhetoric. The group has rules against open carry at demonstrations or rallies. But he said it stands in solidarity with armed leftist groups that do. Back at the pistol range, the Alaska members say armed activism isn’t what they joined up for. The Socialist Rifle Association is proving popular. A little over a month since it was incorporated it’s gone from a humorous Facebook page to a legally incorporated social welfare organization with nearly a thousand card-carrying members. And there are now chapters in all 50 states, including Alaska. Alaska Public Media’s Casey Grove contributed to this report.